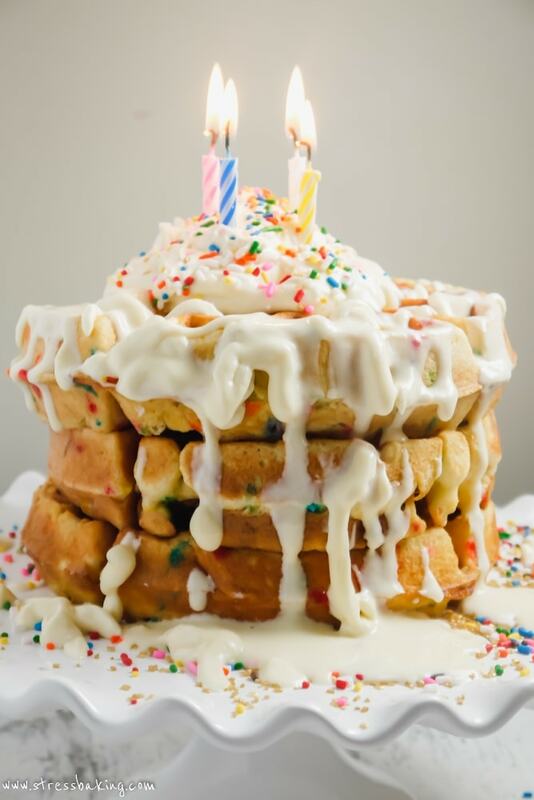 The perfect breakfast for someone’s special day! 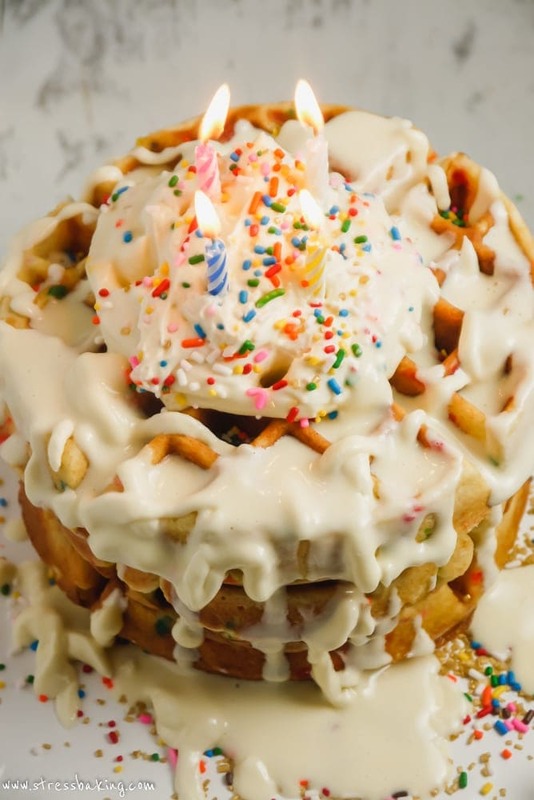 Funfetti cake turned into waffles topped with a creamy maple mascarpone whipped cream. And I decided I wanted to celebrate with a new funfetti recipe for week three of the ramen & funfetti challenge. 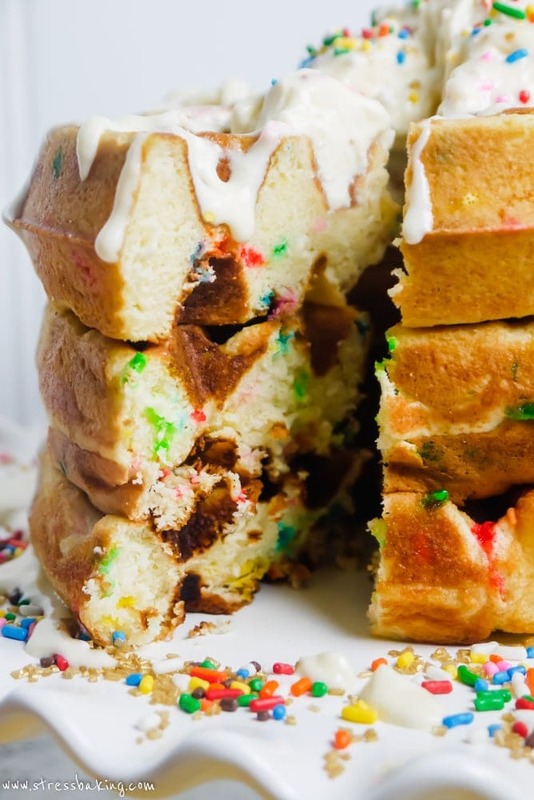 Cake seemed too obvious, too… done. And cupcakes are just mini versions of cake, so those are out. I tried to think outside the (cake mix)box. What else do I like that could use a kick of sprinkles? One of my favorite things to do on the weekend is go out to breakfast. I have a couple places I really love and return to frequently, but I also love exploring new places. One of my requirements for a perfect score on a place is that they serve waffles. If they don’t serve waffles, they get a point knocked off automatically. 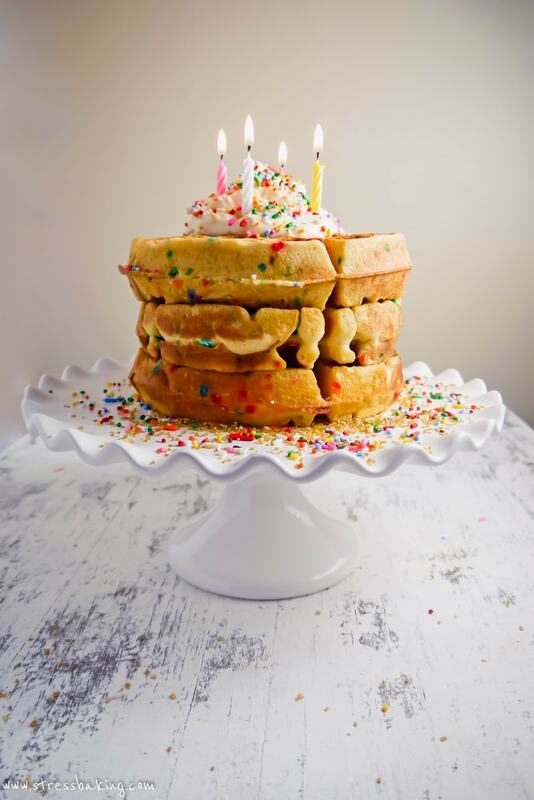 I mean, c’mon – WAFFLES. I hardly ever opt for anything outside the standard waffle topped with fruit and whipped cream. You just can’t go wrong with it. But then I started thinking… what if it also had sprinkles? And what if it ALSO had my mascarpone whipped cream? And what if that whipped cream was maple flavored so that I wouldn’t even have to worry about maple syrup?! And then what if I set it all on fire?! Okay fine, it’s not on fire, per se, but there are flames. Flames of unspoken wishes that are extinguished with hope. Or, you know, air coming out of someone’s mouth. I may have gotten a little carried away with the whipped cream. I melted it down a little in the microwave so I could drizzle it, and I went a little overboard. And… well… you see what happened. ALL the maple mascarpone whipped cream. But I’m not complaining. Not even slightly. 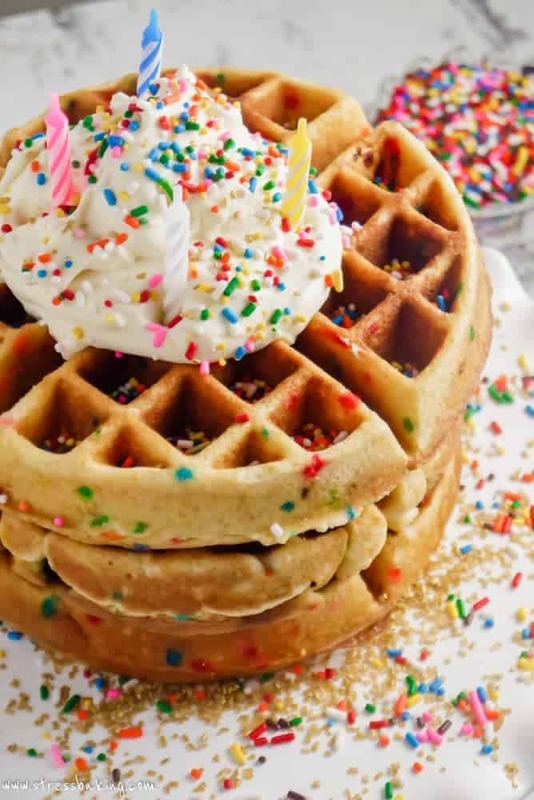 These waffles taste just like funfetti cake, but they’re crisp on the outside and soft and fluffy on the inside. The addition of the whipped cream just pushes them right over the edge. 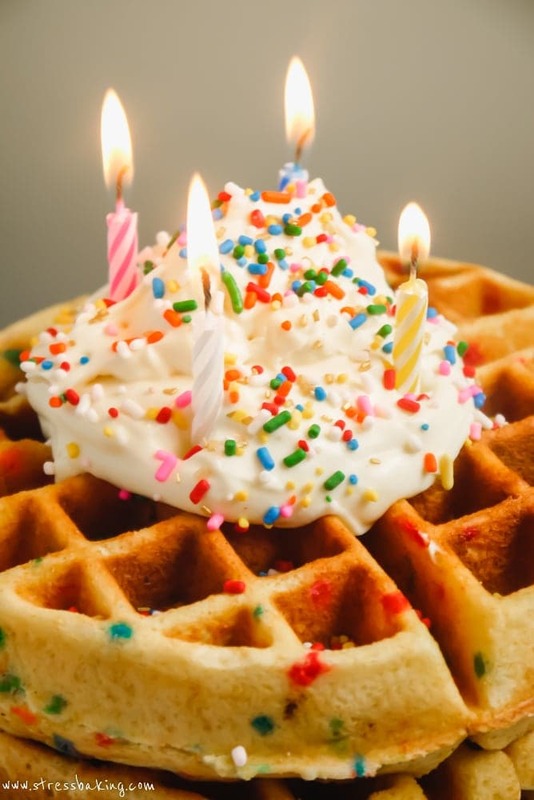 It’s the perfect breakfast for a birthday morning where everything should be sunshine and unicorns. 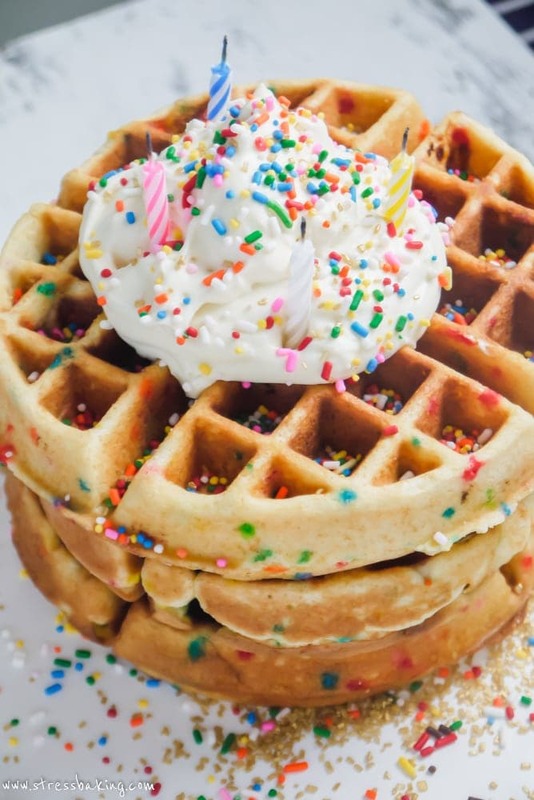 … sprinkles. 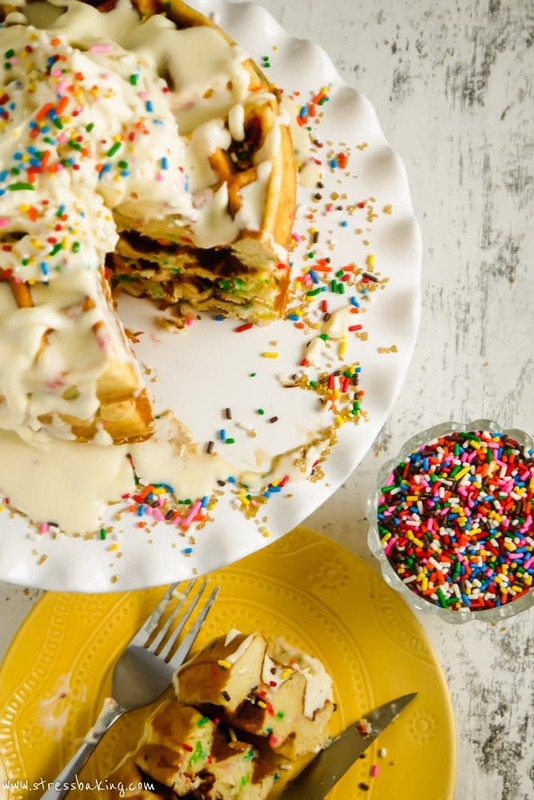 Don’t forget to add extra sprinkles. In a medium bowl, whisk together cake mix, eggs, buttermilk and oil and stir until no lumps remain. Gently stir in sprinkles. 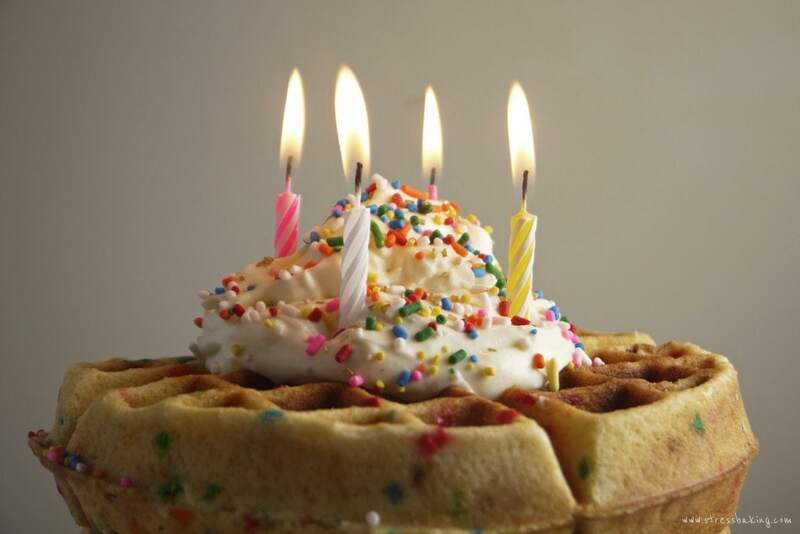 Preheat waffle iron and spray with non-stick spray. Using a 1 cup measuring cup, pour batter into waffle iron and heat until done. In a large mixing bowl, whip mascarpone cheese, heavy cream, sugar and syrup on high speed until completely combined and stiff peaks form – it may take a little while, so be patient! Store in fridge until you’re ready to use. 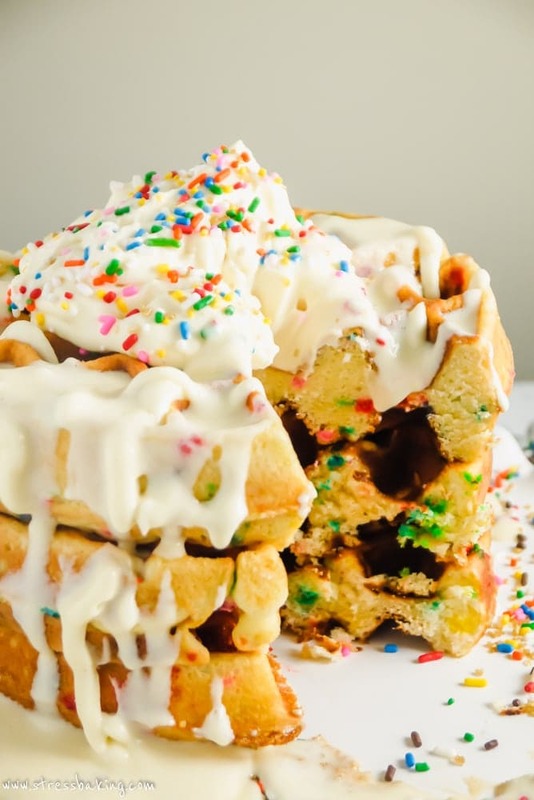 Top waffles with frosting and enjoy!